European holidaymakers favour local destinations that are easy to access. 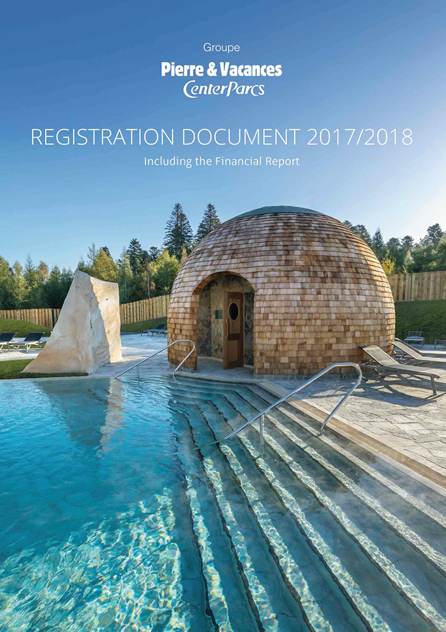 Since its creation, the Pierre & Vacances-Center Parcs Group has responded to this fundamental trend by setting up residences and villages in several European countries. Today it proposes an unrivalled tourism offering in seaside, mountain, countryside and city destinations. Stepfamilies, groups of friends, grand-parents and grand-children: in a society of changing lifestyles and family relations, the Pierre & Vacances-Center Parcs residences and villages enable these new tribes to holiday together in a family home, providing an opportunity to transfer a way of life from generation to generation and to spend time together in the most beautiful regions of Europe, in the heart of a preserved natural environment. Strengthening our leadership position by anticipating changes in our business and client expectations. Holidays are synonymous with freedom: the freedom to choose a destination, but also the programme's contents. For this reason, Pierre & Vacances-Center Parcs has always distinguished between accommodation and activities and services. Holidaymakers can therefore create their stay on an "à-la-carte" basis, depending on their desires and budget. And since our customers are also responsible consumers, the Group offers services and products that fully respect the principles of sustainable tourism. Innovating by imagining new living spaces and leisure activities for all generations. Thanks to its vertical integration model, the Pierre & Vacances-Center Parcs Group masters its activities from A to Z: the choice of location for its projects, the urban and architectural design, financing, building and operation. This original business model, combining tourism and property development enables it to guarantee the quality of its offering and constantly innovate in order to meet the emerging requirements of European customers. From the first car-free village to the future "Villages Nature", the Group's creativity has never failed.